The centaur is one of the classical beasts of Greek mythology. In ancient art, they are often depicted as being about the same height as men, but modern art shows them as being much larger than men. 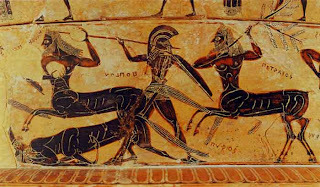 Certainly the description of centaurs using tree trunks and boulders as weapons in their battle with the Lapiths points to a larger stature. 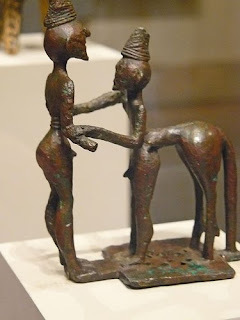 The centaur also appears in Sumerian art, though I am unaware of any stories about centaurs in their mythology. Some of the earliest depictions of centaurs in Greek art showed them as essentially fully human from the front, with the hindquarters of a horse attached to their back. 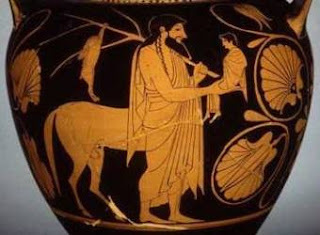 As a civilized centaur, Chiron is shown wearing a chiton, but the typical barbarous centaur went unclothed. They are also sometimes portrayed with pointy ears, though not very frequently. I wasn't sure about the best way to present my centaur miniatures, so I grouped them by manufacturer, and followed up with various size comparison pictures. The horse used in the comparisons is roughly 15 hands high in 1/72 scale. The first group of centaurs are from the Ral Partha Personalities and Things that go Bump in the Night line. They consist of the Centaur Archer (Ral Partha 01-032) Centaur with Spear v3 and v2 (Ral Partha 01-032) respectively. 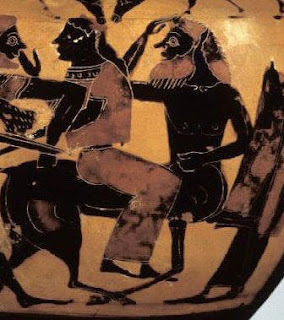 These are classical centaurs, and scale out to about 14 hands high. In the next picture are the Armored Centaur (Ral Partha 01-047), and male centaur from the Centaurs (male and female) set (Ral Partha 02-903). The Armored Centaur is a typical modern fantasy centaur, and stands at about 17 hands high. The other centaur is a classical pastoral centaur, standing at 14 hands high. The final group of Ral Partha centaurs consist of Centaur Adventurers (Ral Partha 02-968), and a Centaur with Sword and Shield (DF-033). All of these centaurs are 14-15 hands high. The next image is of two Grenadier centaurs - an Armored Centaur (Fantasy Lords 134), and a Female Centaur (Fantasy Lords 064). Both are roughly 17 hands high. This next pair below, are a Heritage centaur (Fantasy 1328) which stands at 14 hands high, and a Lance and Laser Armored Centaur which stands at 17 hands high. 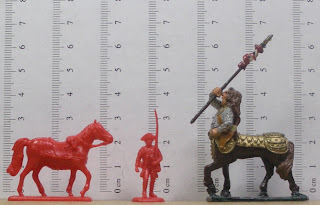 Below, are three centaurides consisting of Sagittarius (Reaper 03376), Lamia from the Heritage miniatures Manticore and Lamia set (1298), and Lyria Female Centaur (Dark Sword Miniatures 1105). The Reaper centaur is very small at 13 hands, while the Lamia is 16 hands. Both have disproportionately large human torsos. The Dark Sword centaur on the other hand, is almost 20 hands high, and has a disproportionately small human torso. The next set of images are of Mega Miniatures centaurs formerly produced by Metal Magic. These centaurs stand 16 hands high, and look to be compatible with 25mm or 28mm figures. A couple of centaurs from Mage Knight appear in the next image. The enormous Centaur Shaman stands 19+ hands high, while the strangely proportioned Centaur Archer is 11 hands high. Its forelegs appear to be twice as long as its hindlegs. It also seems to be wearing leg warmers (?!?!!). 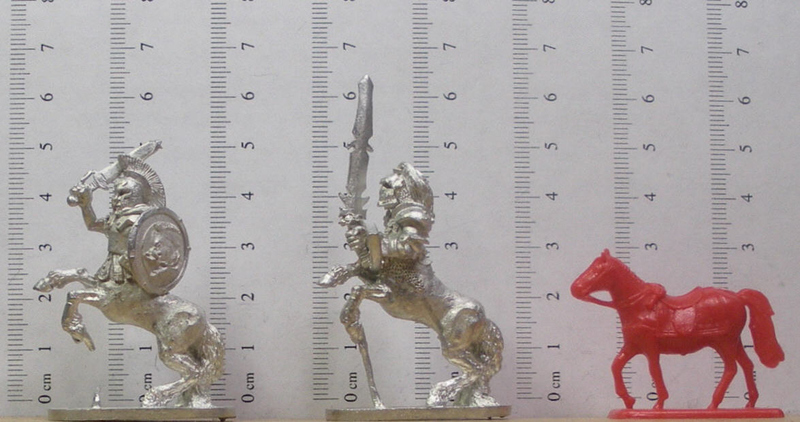 Next are the 15mm centaurs from Eureka, which stand at just over 12.5 hands high. Two more centaurs from Eureka, and an Irregular centaur standing at 12 hands high. 28mm centaurs just seem too big to use in 1/72 scale fantasy to me. Maybe one or two giant centaurs could exist, but I wouldn't use too many of them. My preference for use in 1/72 scale fantasy are 25mm centaurs. Averaging at 14-15 hands high, they are large and imposing, but not freakishly large. I like the old Ral Partha centaurs the best, because they have the wild and untamed appearance that I associate with centaurs. If one were to go by Greek vase paintings, 15mm centaurs would be the best match with 1/72 figures. At 12 hands high, they would be pony sized, but there are sources that say horses during ancient times were typically pony sized (or slightly larger). Very nice review. You could also check out Arcqane Legion's Centaurs. They're advertised as being 20mm. Dohhh! I knew I forgot something. I actually do have some Arcane Legions centaurs. They are about the size of the Reaper Sagittarius (13-14 hands high), thought the torso is better proportioned for 1/72.